It’s raw. Very raw. I’d say practically unedited (alternately, so well edited you can’t tell), and that is precisely what we need in a world of over-sanitised books. 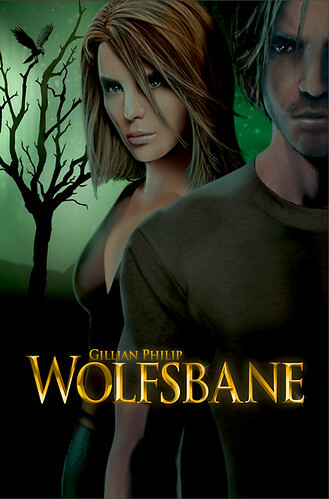 It’s only as you read a book like Gillian Philip’s Wolfsbane, that it becomes obvious how much editorial input most novels have these days. It’s fantastic! If I don’t get to read the next – the fourth and final – instalment of Rebel Angels soon, I’m going to scream. Gillian is simply getting better and better. She is also growing ever more murderous. Expect deaths, both where you want them, but also where you don’t. Looking on the bright side, some characters are alive at the end of this third book about the Sithe, those wild Scottish faeries who love and kill with equal skill. Time has moved on a little, and we have two new teenagers, as well as the two teenagers from Bloodstone, who are now mature. Sort of mature. I’m not quite sure whether time has moved as much on one side of the Veil as it has on the other. I don’t always ‘get the time.’ But the list of characters was a godsend. It helped me remember, because let’s face it, Gillian doesn’t pick the easiest of names. Queen Kate is evil, as we well know. But we don’t see so much of her this time. It’s mainly ‘at home with the MacGregors’ and that is exciting enough for me. A lot of anger and a lot of not-so-romantic love. Which, of course, makes it really very romantic indeed. If you haven’t started, get a move on. You will thank me later. This entry was posted in Authors, Books, Reading, Review and tagged Gillian Philip. Bookmark the permalink. Ah Bookwitch, thank you so much! I am beyond chuffed with quite the nicest start to a Monday morning I’ve had in ages. Oh yes, Mondays. I was thinking of how to brighten up the start of your week. Obviously. The editing. Ah. Let’s call it shabby chic, then. Alison and Lucy are clearly your interior decorators/designers, who know where and when to reintroduce the dirt. What I’m saying is that books need a little dirt, artfully applied. Have read the first chapter and am frustrated as life conspires to keep me from the rest, so, after painting some hares today I hope to settle to find more. Is the ‘mistake’ in the list of characters? Feed the hares to Seth, and just read. *blush* As I keep saying, all I did was to ask questions about stuff I wanted to know, for Gillian to think about. The book was already a magnificent triumph before I laid eyes on it. I’d ask for a cut. Hmm. And yet MORE stuff for the list. Especially as it has murderous faeries. But you DO need to read the first two, first. Do you reckon you might fall for Seth MacGregor, too? As long as it’s not the bad Queen.